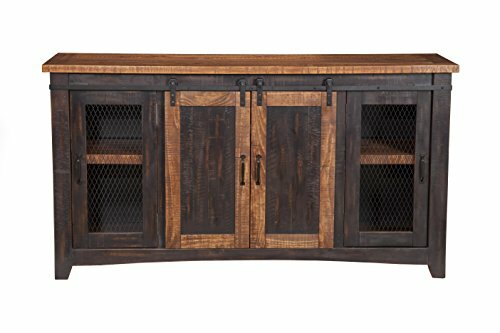 The Santa Fe TV stand is a gorgeous rustic style TV stand. Constructed of solid pine and pine veneers in an Antique Black and Aged Distressed Pine finish that offers just the right amount of distressing that can blend easily with other rustic, distressed, warehouse, farmhouse, or Loft looks. Two sliding barn style doors that slide side to side on a black metal track. The two side doors feature a metal mesh style look that adds to the rustic and distressed look. Four (4) total interior shelves are removable and adjustable providing versatile storage options for audio, video, Gaming components. Cable management cutouts are conveniently provided for the main cabinet and outer cabinets. Ideal for most 65" flat panel TVs and up to 70". anti-tip kit added for safety. Assembled Dimensions: 65" L x 35" h x 19" d. Product materials: pine, pine veneer, metal. Assembly required. If you have any questions about this product by Martin Svensson Home, contact us by completing and submitting the form below. If you are looking for a specif part number, please include it with your message. WE Furniture X-Frame Metal & Wood Console Table in Rustic Oak - 60"